Roon is a paid software suite used to manage a digital audio library and play it to one of many Roon enabled playback devices. It is used in conjunction with a Roon enabled playback device. Roon Controller is an app used on either a tablet or smartphone (iPad, iPhone, Android device etc). This presents the user with an interface to control a Roon Core, allowing for music to be selected, playlists to be created and output devices to be chosen. Roon Core is effectively a server. Roon Core runs on either a PC, Mac, select NAS (Synology or QNAP) as a program. Alternatively, Roon Optomized Core Kit can be installed on specific hardware such as an Intel NUC or Roon's own Nucleus and Nucleus+ as a complete operating system (OS). What does Roon Controller do? As mentioned before, Roon Controller is simply an interface used to browse a music library that is managed by a Roon Core. Roon Controller presents your music collection by its existing tags such as Artist, Genre, Album, Track title etc. One of Roon's main selling points is its user interface. As Roon Core analyses your library (more on that later) it grabs artist information such as biographies, band members or composers and other contributors and displays these in visually stimulating way. It also displays artists that are similar to, inspired by, or who have inspired the current playing artist making music discovery easy. "You browse and play music with Roon apps on all your devices – Mac, Windows, iPad, iPhone, and Android devices." Roon Controller also allows you to select where you want your music to be played. This is in the form of a playback device, such as a dedicated streamer or Roon Core and DAC. Roon has the ability to stream to multiple devices at once, playing either the same track across multiple devices or different tracks to discrete zones. What does Roon Core do? 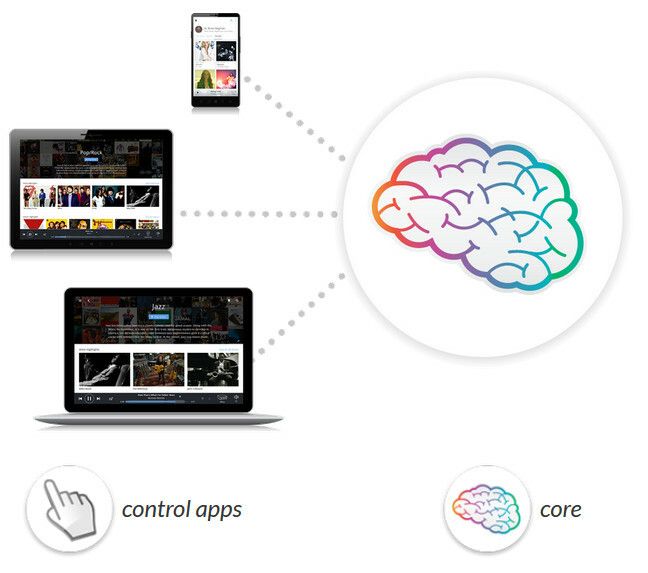 Roon Core is the software that manages your library. Roon Core can either be installed on a PC or Mac as a program. Alternatively Roon Optimised Core Kit (ROCK) can be installed as an Operating System on an Intel NUC or pre-installed on a Nucleus as a dedicated solution. Roon Core can analyse and index both local files stored on a Hard Disk Drive (HDD), as well as network shares on a Network Attached Storage (NAS). Roon Core also has the ability to work in conjunction with Tidal. This allows the user to browse both locally stored files and Tidal's extensive catalogue simultaneously. This is viewed seamlessly through Roon Controller, or directly on the PC, Mac or ROCK installation. Roon Core also has the ability to provide music recommendations, automatic playlists based around similar artists (Artist Radio) and makes discovering music much easier compared to conventional streamers. 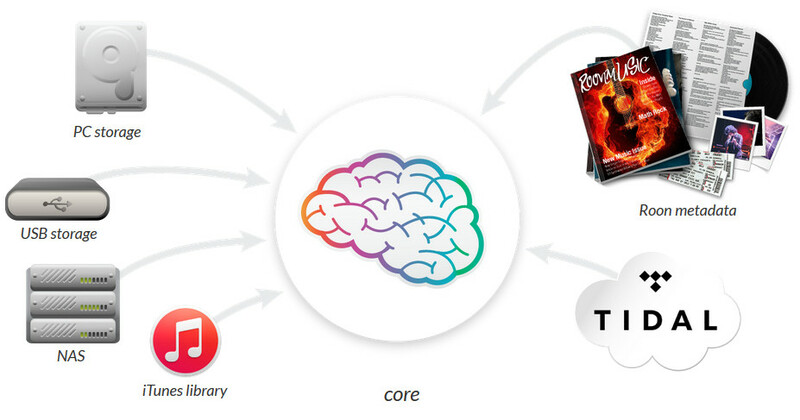 "The core manages your music collection from many sources, and builds an interconnected digital library using enhanced information from Roon." As Roon Core runs on a computer, it also has the ability to act as a digital source. This is controlled either directly via the program's interface, or via Roon Controller installed on a tablet or phone. This means that you can connect a Roon Core device directly to a DAC via USB, transforming the device into an audio source. Because of Roon's ability to play multiple streams at once, the user can plug multiple DACs into the available USB outputs, allowing for playback on multiple systems simultaneously. Again, this is all controlled either directly or via Roon Controller. It also handles any decoding / recoding / trancecoding required, so that your endpoints all see the best quality digital format that they can handle. So what is ROCK, Nucleus and Nucleus+? As mentioned earlier, Roon Core can not only be run as a program on PC or Mac, but as its own Operating System(OS). This is where Roon Optomized Core Kit (ROCK) comes in. ROCK behaves in a very similar way to Roon Core. The major difference is that it has more control over the hardware it is installed on. ROCK has been coded specifically for use with Intel's NUC devices. This means that the engineers at Roon have complete control over computer processing allocation. This allows Roon to prioritise the audio processing to a much higher degree when compared to running on top of Windows, MacOS or Linux. ROCK, like Roon Core can access either locally stored audio files or access remote content on a NAS and Tidal. 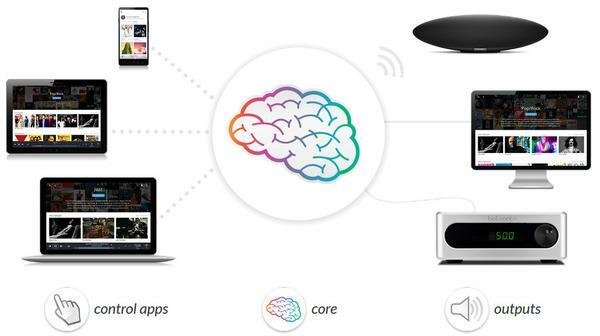 Roon Nucleus and Nucleus+ are Roon's own hardware platforms. These are effectively an Intel NUC made to Roon's specification and housed within a custom, passively cooled case. It is important to note that the installation of ROCK on Roon's Nucleus and Nucleus+ is functionally identical to all other ROCK releases. However, the back end development of it is designed specifically for the Roon hardware. Some reviewers have claimed there is sonic merit to the Nucleus over the standard NUC. The Nucleus is based around an Intel core i3, 4gb of RAM. The Nucleus+ is based around an Intel core i7 and 8gb of RAM. If you are planning to use Roon to stream to more than 5 playback devices at a time the i7 model should be opted for. The main benefit of having a dedicated ROCK component such as Nucleus/+ or Intel NUC is that it can be left on and always accessible. It can be located either next to a router and streaming to a Roon Playback Device, or within a HiFi setting plugged into a DAC via USB. Comparatively, having Roon Core running on a PC or Mac means that the computer would need to be powered on whenever the user wishes to use Roon. What is a Roon enabled playback device? "Roon streams to all the audio gear you have, and makes it all play nice together." When using a Roon enabled playback device, the device must first be enabled. To do this, make sure the device powered on and is connected to the network if it is a streamer, or plugged into the Roon Core / ROCK via USB if it is a DAC. Go to the Menu located at the top left of either Roon Controller or Roon Core. Select this to change to your playback device. The Roon software is all free to download. However, to use Roon a license is required. This can be purchased on either a yearly subscription of $119 per annum, or a lifetime subscription of $499. Of course, you can also sign up for a Roon Trial, where you can download the Desktop version of the Core and give it a test drive. A Roon license must be purchased to use Roon on any hardware. Roon Nucleus and Roon Nucleus+ do NOT include a Roon license. The user must purchase this independently to use the product.